Bubble teas -- often called boba teas -- come in a variety of flavors, including taro. 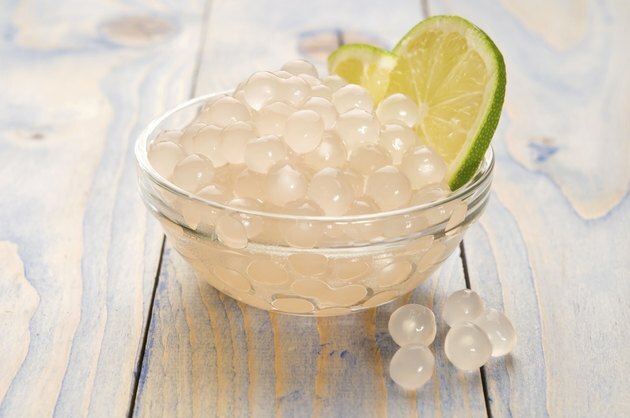 These drinks are typically made with milk, tea and tapioca pearls, which provide the "bubbles." Despite the name, however, taro bubble tea does not always contain tea leaves, and therefore some versions are not true "teas." Taro is a starchy plant that's common in the Asia-Pacific region. Although taro itself is rich in nutrients such as potassium and fiber, the highly processed taro powders found in bubble teas are generally not. For example, one brand of taro powder lists sugar as the first ingredient, then nondairy creamer, milk and natural and artificial flavors. Another lists nondairy creamer, two types of sugar, taro powder and extract, and artificial colors. Therefore, taro bubble teas may have some of the flavor of taro, but little of the nutritional boost. In addition, taro bubble teas are generally high in calories -- one brand's powder contains 65 calories per serving, and that doesn't include the milk typically used as a mixer.